Welcome | Eat Live to Thrive! Welcome to VeganOvercome.com. Your visit is not taken lightly. If you are on a journey for optimum health and longevity, please consider subscribing to the Veggie Chronicles Newsletter. It is a periodic e-Newsletter that will have lots of great information to inspire, encourage, help, instruct, and empower you to live a more healthy life through a plant-based eating lifestyle (along with other good stuff). It’s free and you can unsubscribe at anytime you want if you feel that it is not helping you. I had never been an ‘out of shape’ sort of guy. I had always been active, athletic, a competitive martial artist, surfer, an avid extreme sports adrenaline junkie. I always ate whatever I wanted to eat and never gained weight. I ate meat in some form with almost every meal. Those who knew me always said (and still do) that my body looked 20 or 30 years younger than I was. From my perspective, life – especially my health – was blessed with good fortune. But, it was what I couldn’t see, that almost killed me. What I didn’t know however was that even with all the activity in my life, my own personal home gym with thousands of dollars in commercial grade weight machines and free weights and eating what most would call an exceptionally healthy diet, I was dying on the inside. I was suffering from an ACUTE CHRONIC ILLNESS that was leading me happily to a sure end through what could have ended up a terminal illness – yep, …the “C” word. I was just a few short years away from the end of my life and didn’t even know it. Changing my diet saved my life. I was just a few short years away from the end of my life and didn’t even know it. Changing my diet saved my life. Hi! 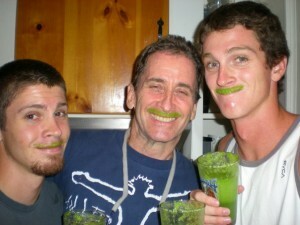 My name is David Ward and the picture to the right is of myself and two of my amazing boys hamming it up for a ‘green mustache’ photo opp. I started this website as more of an online journal to collect health information and do some writing about my transition from a heavy meat, dairy, processed foods, and sugar diet to an almost completely raw vegetable, fruit, nut, I cannot count the number of raised eyebrows and contorted facial expressions I received (and still receive) I got when people would find out that I was not seeking ‘medical intervention’ and trying to go it on my own.seed, legume, and grain diet – enough so to classify me as a raw vegan. To the shock and horror of many of my friends and family, I began consuming the weirdest things. Among my daily regiment, I drank things like raw spinach, kale, and mango smoothies, fresh wheat grass juice, apple cider vinegar, hot lemon water, fermented Kombucha tea and Rejuvelac. I consumed an ongoing plethora of raw dark green vegetables, various roots and rhizomes, seed sprouts, dark colored fruits, nuts, herbs and spices on a daily basis. As you will learn through regular visits here on Vegan Overcome and by subscribing to my newsletter, there are a GREAT many changes you can make in your eating lifestyle that will rock the world of your health and well-being. I cannot count the number of raised eyebrows and contorted facial expressions I received (and still receive) that I got from people when they would find out I was not seeking ‘medical intervention’. But, I was on a mission. I was going to beat the system. I was going to overcome the odds that were stacked against me. I was choosing to eat live, healthy, life-giving, healing foods over that of seeking out traditional medical intervention which chooses to use poisons and toxins to “heal”. If you find an article or tidbit of knowledge that you really like or that has been helpful to you, leave a comment and let me know what you think. If you find the Vegan Overcome website beneficial, please take a moment to share it on your favorite social network(s), with those you care about, or those who are struggling with chronic illness or obesity. If they want to make a change in their life for the better, I think I may be able to help them. What better gift to offer someone than a healthier, longer, and more productive life, right? My wife and I wanted to leave a comment and tell you that you how much we have enjoyed reading and learning from your experience with chronic illness. we are optimistic. and thanks for referring us to the reference materials on alkalizing blood. Great stuff here. looking forward to getting my “veggie chronicles” newsletter (love the name). I have been doing smoothies you recommend and loving them. lost 17 pounds by just replacing one meal a day with live food smoothies. thanks! Wow, marvelous blog! The overall look of your site is wonderful, let alone the content! Thanks for all the useful information. It really motivates me to take control of my health. Hello! Thank you for this website. It is beyond inspiring! I have a quick question regarding “Juicers”. I am an amateur to all of this and really need some direction and guidance. I also am very overwhelmed trying to pick out a juicer. There are just so many out there. Knowing that you have a lot of experience over the years juicing, would you be able to recommend a juicer that you like or possibly the exact juicer that you have? I am not as concerned about cost as I am about quality. I am worried that I might purchase one that is not to my liking and then not be interested in juicing. Hoping you can help. Thank you so much for your time and understanding. Hi Sue! Thanks for posting your question. We get this question allot. While we try to remain neutral in our editorial and recommendations for these sorts of things, we do most often suggest making a long-term commitment to one’s health when it comes to juicing and getting a juicer that will give you a long service life (aside from normal wear and tear). We have found that the Breville Juicer we offer through our website is the ideal juicer for the price. If you do not want to pay an excessive amount for a juicer as you are starting out, it is a fine middle of the road investment. You don’t need to pay $1200 for a juicer to get great results. The Breville model we offer our readers is a great juicer for a very modest price in the way of life and service. Please let us know if we can provide you any further information. Your story is very inspiring David. Thanks for being willing to share it with the world and help others in their pursuit of better health. Thanks for such an informative site. It’s refreshing to show up at one and not feel like I am being sold something from the moment I show up. How do you make money with this Website. There seems to be just great content and no gimmick. Thanks for geting me to try the ‘green smoothies’ (even though the sound of them still bothers me…hehehehe). I have already lost 17 pounds in just 3 weeks replacing my dinner with one, increasing my water intake, and bypassing the drive through window. This is crazy for me, but I love it. Great articles here. I feel healthier just reading them. Im bookmarking and will also be tweeting this to my followers! Outstanding blog and amazing design. So often we pray for healing, expecting that Jehovah Rapha will instantaneously heal us. Sometimes that is the case – I do believe in miracles, but many times He empowers us in our choices to facilitate the healing. Rest can be the healing. Diet and exercise is also part of the equation. Having been raised Seventh-Day Adventist, I have long been acquainted with the benefits of a vegetarian lifestyle, but it is nice to see spirit-filled passion treating the body as the temple it is. This is a very nice site David Ward. Vegetarian maniac that you are, I should have known you would have something like this floating out here in cyberspace. I have learned quite alot about health today that I did not know, and especially like the smoothie recipes. Will be checking that out for sure in the next week. Hi David, I found very important health information in your website. I wanted to say hi! God Bless You!!! Hello there, I first came to your website through a google search, and have been enjoying the information now for about three months but never said anything until now. I want to thank you for all the wealth of knowledge you appear to have (or whomever is writing all the articles). It has helped me immensely. I am now drinking your smoothie recipes and have noticed such great results in my efforts to lose weight and regain my health. THANK YOU. THANK YOU. THANK YOU. This information is very educational, I’m willing to give it a try, especially on the Wheat Grass. May GOD continue to bless you in your work. You are helping so many. Nice little website. Do you offer personal coaching on diet? Thanks for stopping by Dominic. The site has started to take on a personality of its own and we are getting a lot of mail for this request to start offering some sort of coaching or program people can follow. Email custserv@ here and put ‘interested in coaching’ in the subject line. We will be sure to get you added to the list for our program that is in development now.